The Society and its predecessors have been publishing information about the Santa Fe since 1969. The Society offers exceptional publications on the history and modeling of the Santa Fe. From its flagship quarterly magazine, The Warbonnet, to its comprehensive books on history, motive power, rolling stock and modeling, the Society is the definitive and authoritative source on all things Santa Fe. 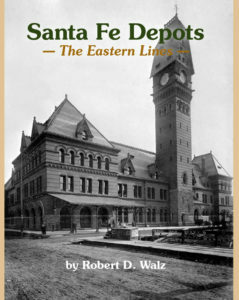 Check here for news on the newest books and materials released by the Santa Fe Railway Historical and Modeling Society! We are the definitive source for complete, accurate information on the Santa Fe Railway. 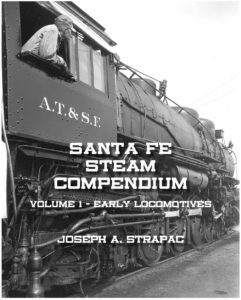 Santa Fe Steam Compendium Volume 1, By Joseph A. Strapac. 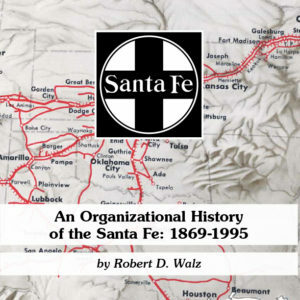 This book catalogs the known steam locomotives operated by one particular railroad business enterprise over the course of its corporate existence, commonly known as the Santa Fe Railway. It is the first of two volumes, addressing the locomotive wheel arrangements used on the Santa Fe beginning in the 19thCentury. In effect, this publication is a database—a formal collection of tables, summarizing and cross-referencing the more than three thousand steam locomotives owned and operated by the Santa Fe between 1869 and 1983. These tabulations are the result of dozens of man-years of labor, beginning with the efforts of anonymous clerks in the offices of forgotten locomotive manufacturers and railroad corporations. Eventually Professor Sylvan R. Wood, Oklahoma Agricultural and Mechanical College, Stillwater, Oklahoma created a locomotive roster database for the Santa Fe. (This is not a reprint of Iron Horses of the Santa Fe Trail.) This publication is a digital, updated version of that original database. 590 pages, tables, folio drawings, 492 photographs. Available on CD. The Society’s quarterly newsletter, Running Extra, features Society news to keep members up-to-date on new books, products, minimeets and other aspects of Society operation. It also features the Santa Fe Challenge – an opportunity to test your knowledge of Santa Fe history against other members, Questions and Answers collected from the Society’s forums but judged of general interest, and an ever changing mix of short articles on research, history and employee anecdotes of their lives on the Santa Fe. 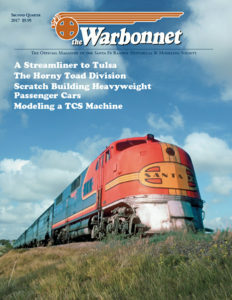 The Running Extra is typically 8 pages issued quarterly in conjunction with The Warbonnet. Members receive the Running Extra as part of their membership. Passenger Car Reference Series. This series of five books covers the Santa Fe’s head end cars, coaches, chair cars, dining, parlor and beverage cars, business and special purpose cars, and sleepers. Supplemental materials provide lists of passenger consists. Reprint Series. The reprint series reproduces critical documents that help tell the story of the Santa Fe in its own words. It includes time tables and other materials. Click here to learn more about the Society’s Book Project and the individual books that comprise each series. Click here to browse and purchase Society books, and much more! Requests for permission to reprint Society materials should be directed to Eric Hiser.